From March 7-14, 2017, a team of 5 researchers from Stanford and Harvard Universities, in partnership with Fish'n Fins dive operation and the Micronesian Shark Foundation conducted a pilot study to assess different methods for administering a census of pelagic sharks in the waters of Palau. 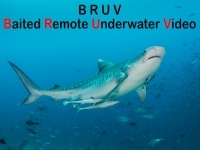 In 7 days they conducted 11 BRUV (Baited Remote Underwater Video), 114 eDNA samples, 15 dive surveys and 42 isotope samples. The following video footage is an excerpt of 11 BRUV sessions.